We’re pleased to announce a new partnership with The Sign Company Scotland Ltd, who will be supporting the Scottish Road Car Series with signage in 2018. The Kirkcaldy based company provide a range of services from vehicle wrapping, to personalised clothing and bespoke signage solutions. Tomorrow, Saturday 14th April, marks the start of the Scottish Road Car Series with round 1 taking place at Ardeer in Ayrshire. 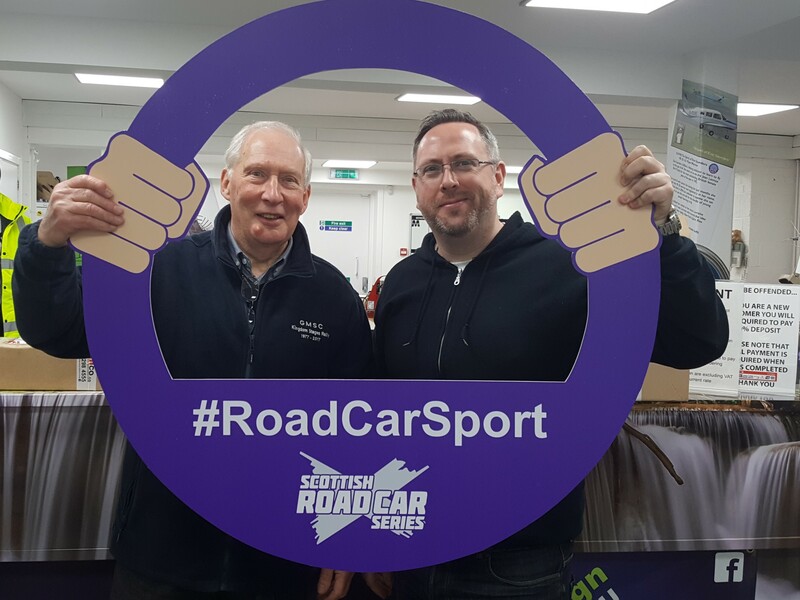 As well as providing banners for the event, The Sign Company Scotland Ltd have designed and produced our very own version of the selfie frame; ‘the selfie steering wheel’ ! The ‘selfie steering wheel’ – which is pictured on the right with Sign Company Scotland Director, John Cunningham, and Glenrothes Motor Sport Club’s Graham Murray – will be travelling to all our events to help capture some of the banter outside of the competition itself and to help raise awareness of the Scottish Road Car Series. Watch out for competitions involving the selfie steering wheel and our new hashtag #RoadCarSport on social media!